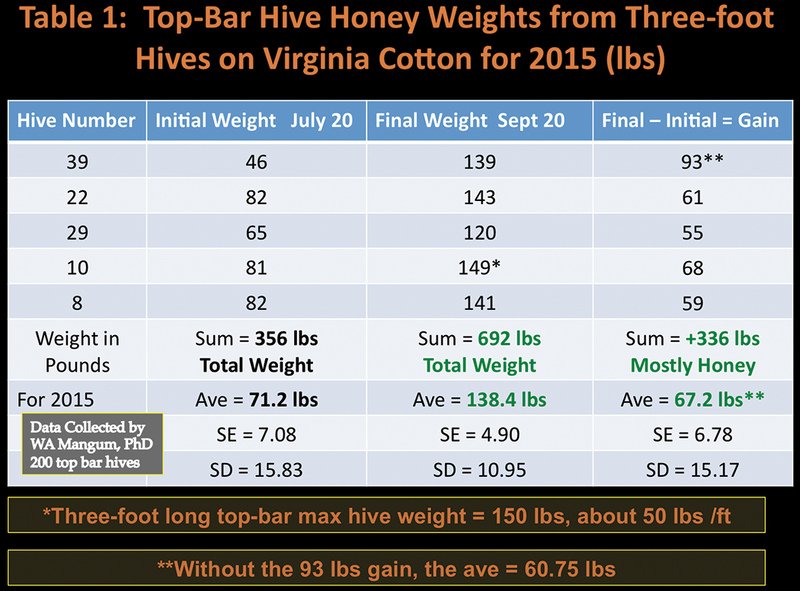 This article provides data on cotton honey production from top-bar hives collected over two seasons. The first season was a trial run, setting the stage for a larger study in the second year. I am planning a third season too. 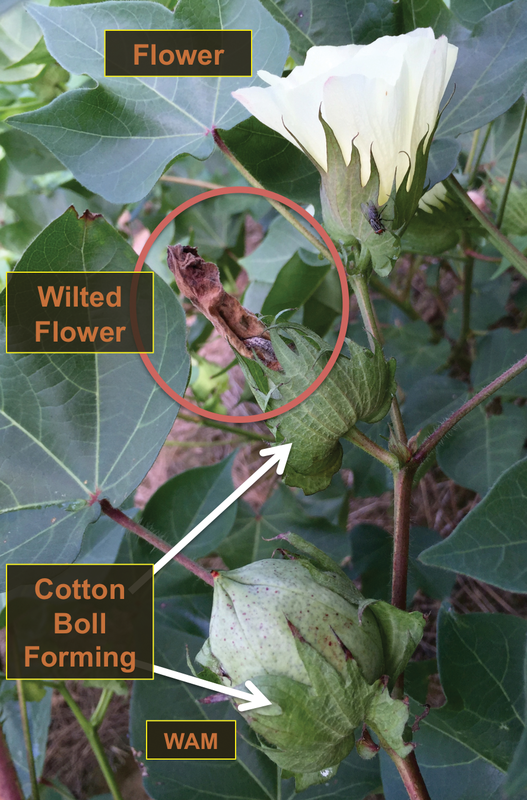 At the end of the growing season, vast expanses of cotton reveal the split open bolls (see Figure 1, see below), each boll once a white okra-like flower (see Figure 2) yielding nectar. (The plant also has extrafloral nectaries.) Cotton honey has a pretty light-amber color (see Figure 3). 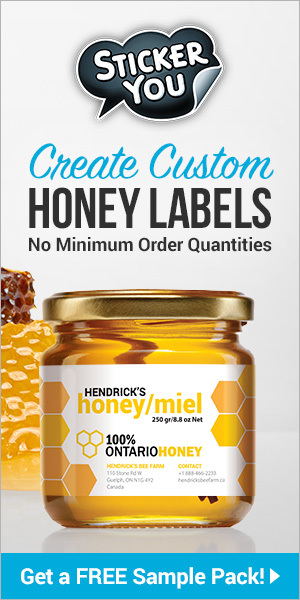 However, the honey is not regarded as “table grade,” due to its bland taste and propensity to granulate. 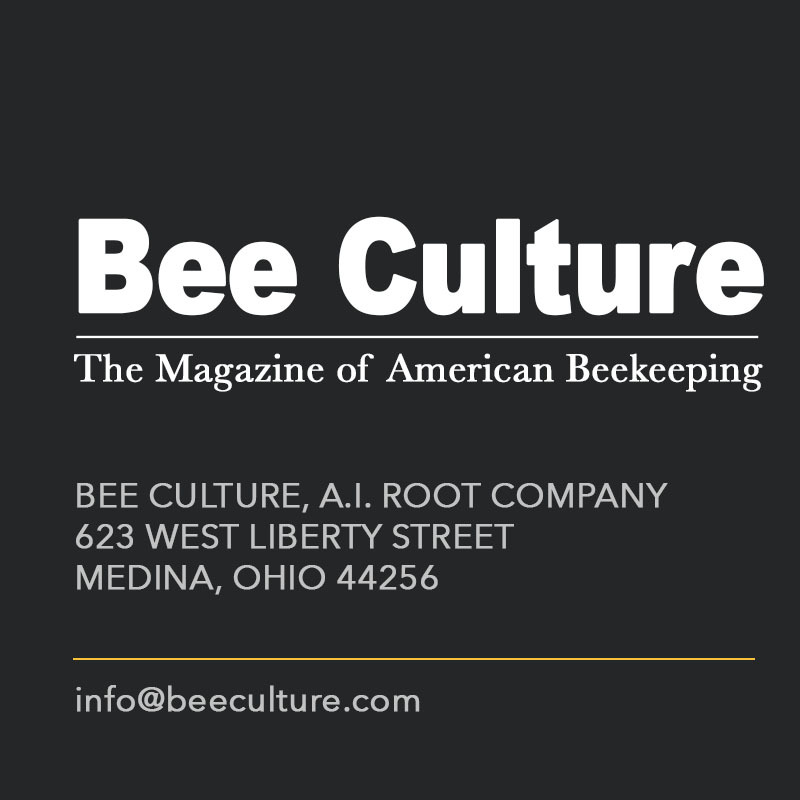 I have a long history with cotton honey as a strategic asset to feed my pollination top-bar colonies, knowing the difficulties without Summer nectar. Figure 2. A cotton flower. After the bloom (top) the flower wilts (middle), and the cotton boll forms (bottom), which eventually splits, exposing the snow-white lint. When I lived in Raleigh, North Carolina, I moved 200 two-foot long top-bar hives to the Rocky Mount area for cucumber pollination. That was about eight tons of top-bar hives, and I moved them working alone. I loaded the hives by hand on a small-sized truck and trailer, in the late 1980s. My colonies lost seven to 10 pounds while on cucumber contracts, before the remaining Summer would cost them even more honey. At first pest problems caused a ban on cotton production. Then cotton returned and my second largest bill–sugar–vanished. (Gasoline was the first.) So I learned the biology of cotton. Now I live two hours North of cotton’s Northern (reliable) range ending in Southern Virginia where cotton fields bloom from July well into late Summer. With occasional rains, cotton provides a slow steady nectar flow, a strategic situation to collect honey production data. I still need to watch my hives for summer swarms and usurpation, which are becoming more common. 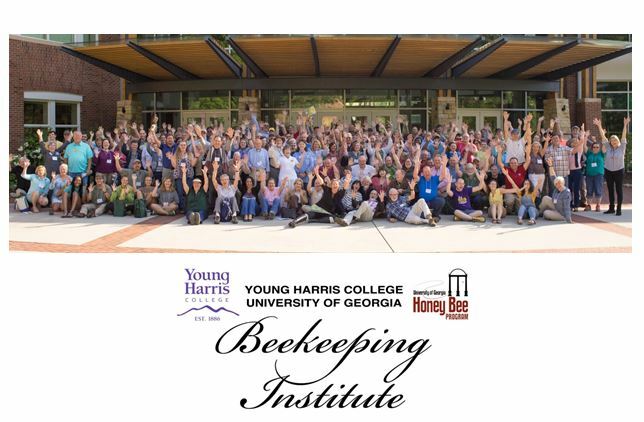 That is part of the new beekeeping reality as our bees are apparently undergoing genetic changes. (This past Summer 2016, I saw four summer swarms in the data-collection apiary. I did not see any usurpations. However, usurpations are not easy to witness.) So far pesticides have not been a problem with cotton, although I consider them a constant potential hazard. economy prosperous enough to build comb. On July 20, 2015, I moved five three-foot hives to cotton. I put the hives on saw-horses and two-by-fours that were about even with the tailgate of the truck. The elevated hive stands reduced stress on my back. Most of the hive moving was shifting the hives horizontally between the truck and the hive stands. 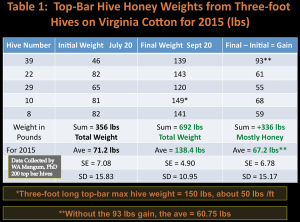 Figure 4 shows the hives for the Summer of 2015, on cotton for two months. 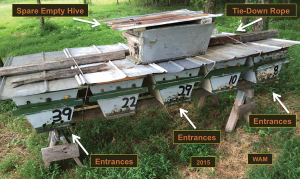 As shown in Figure 4, I alternated the entrance ends of the hives to reduce drifting. In addition, I kept the row of hives no longer than about five. 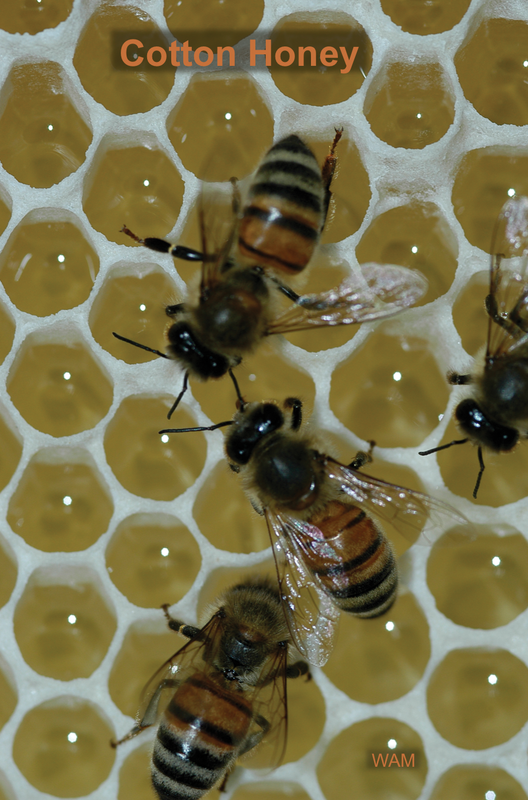 Drifting, where bees enter the wrong hive, can create artificial foraging differences between colonies based on a hive’s location. 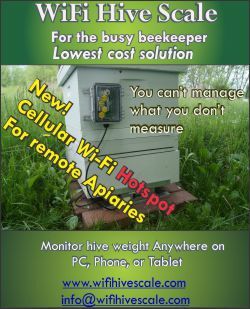 I cannot have that effect in my hive-weight data where each colony must forage independently of the others. Figure 4. For 2015, five three-foot top-bar hives. I want a flat shaded location with reliable truck access, and sheltered from strong thunderstorms. I cut a set of six entrances in both ends of the hive, but I only use one set at a time. I alternate the hive entrances. Scrap sponges block off the unused entrances as seen with Hive 22 and Hive 10. My main concern with colonies so far from the house was – could they cover their combs and protect themselves from small hive beetles? In the heat of the Summer, small hive beetles can force a weakened colony from its hive–evict the bees while sliming its combs. 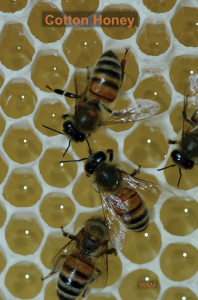 Since the colonies matched the amount of comb in their hives from the Spring, I accepted that as part of the colony-to-colony variation in honey production (rather than trying to equalize them). Over the Summer of 2015, the local cotton did not experience any serious drought, as far as I knew. Cotton can withstand some dry weather and still produce nectar. When the leaves droop I worry, but I never observed that. In September, after two months on cotton, I moved the five top-bar hives back to their home apiary, beginning at dusk. I can load top-bar hives fairly quickly, but weighing heavy hives at the same time would slow me down while trying to finish before dark. I just loaded the hives and tied everything down because all that work had to be done correctly for safety on the highway. I weighed the hives in late afternoon the next day, letting the bees have their first orientation flights undisturbed (see Figure 5). 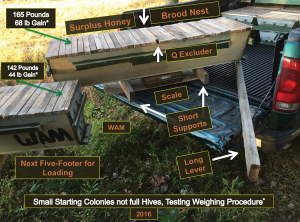 To begin, an important number to remember is 150 pounds, my “theoretical” maximum weight of a three-foot hive crammed full of honey, or an extremely “honey bound” hive (at about 50 pounds per foot with my standard cross section size as shown in my book). I have had colonies break through this maximum weight, but rarely. The first column in Table 1 shows the hive numbers. 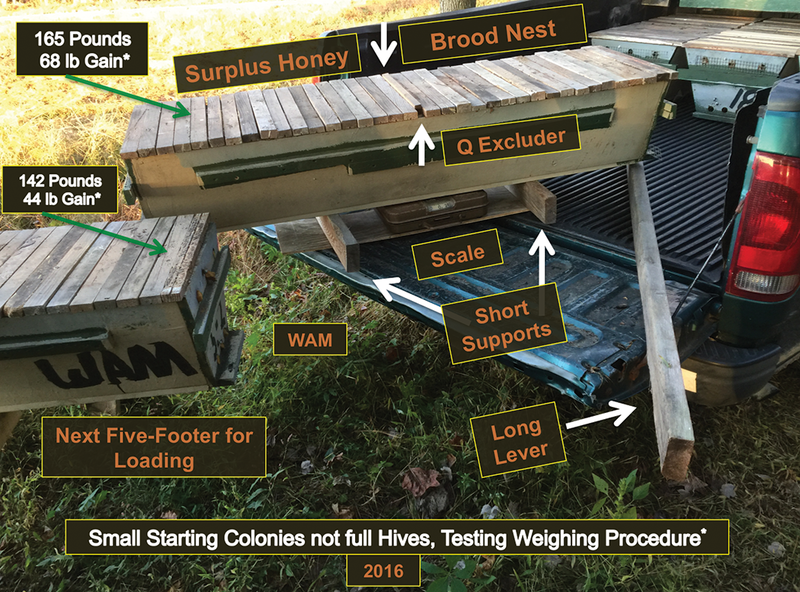 Starting out in July, the second column gives the initial hive weights. Three of the hive weights were surprisingly similar, in the eighties (82, 81, and 82 again). Nevertheless, one weight was lower at 65 pounds. In the Fall, an 80-pound three-foot long hive is usually heavy enough to survive the Winter in my location of Piedmont Virginia. With no cotton over the Summer, the latter colony would need Fall feeding, and maybe the first three colonies, depending on how well they maintained their weight over the Summer. Hive 39 would become the remarkable case, which started completely unplanned. 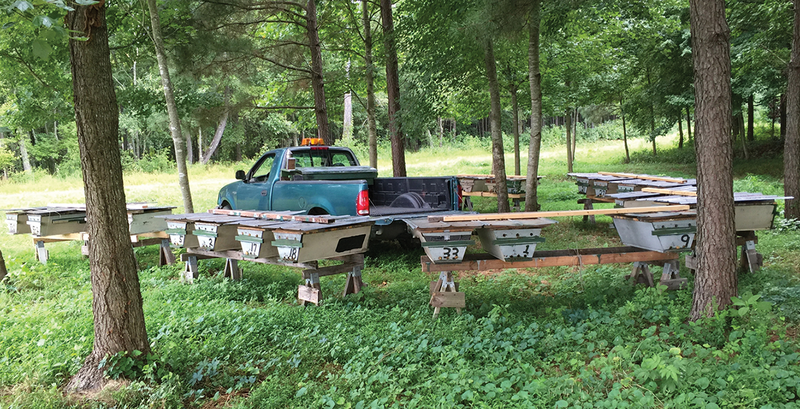 When loading hives that morning, I wanted them coming from one apiary with similar weights, but I was one hive short. There was no time to drive to another apiary, and look for another hive, losing time to a rising sun, before a two-hour drive south. So on went Hive 39, last and the least in weight. 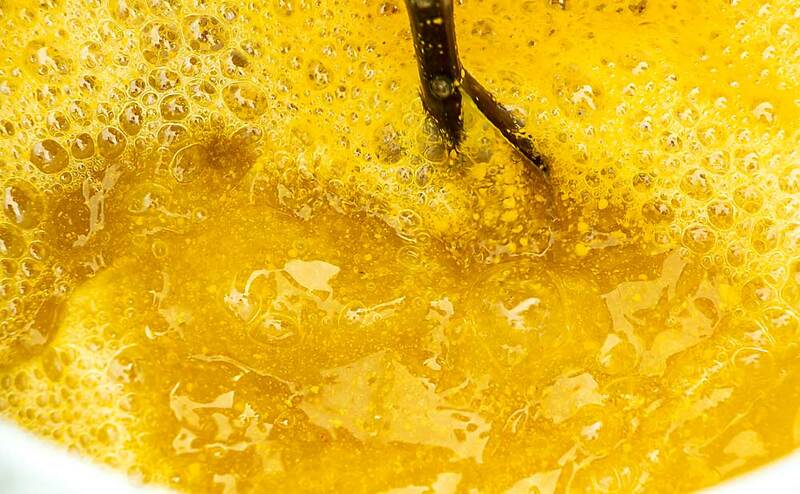 At only 46 pounds, Hive 39 is roughly half the weight of the ones in the eighties. Hive 39 was like a late July swarm, not worth a fly as the old swarm rhyme goes. The colony appeared weak in the three-foot hive. It only occupied about the first one-foot of the hive (from the entrance end). 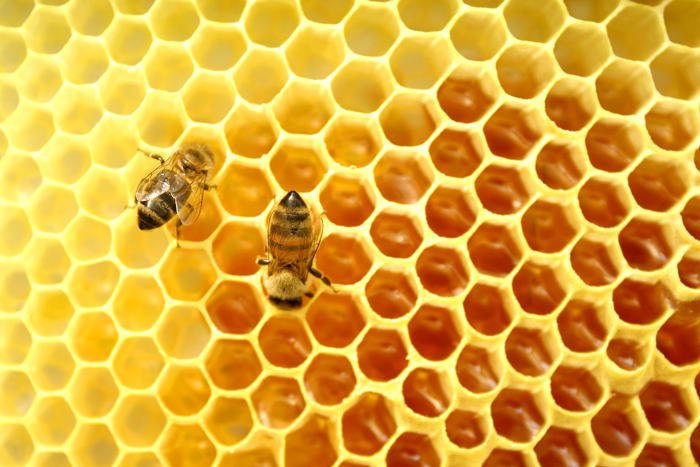 In a race to the heaviest hive, Hive 39 started out way behind, but it could cover its combs. Figure 6. Hive 8 full of bees for the Fall. Usually bees leave an empty comb or two next to the entrances, but not here. This colony needed to be in a five-foot hive. In the Spring such a strong colony would need careful management to prevent swarming. 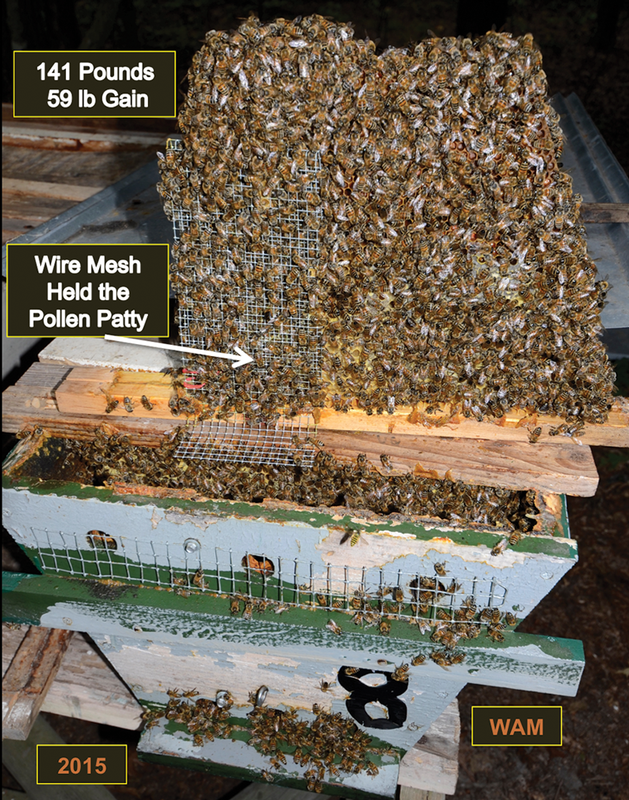 The wire mesh bracket held part of a pollen patty, which the bees quickly consumed. 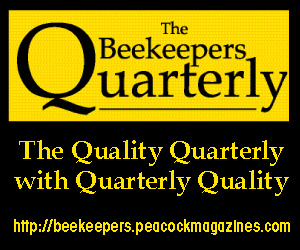 Summing down column two, the hives initially weighed 356 pounds total or averaged 71.2 pounds per hive. However, that average included Hive 39, whose extra lower weight drove down the average somewhat. With averages, what exactly is included in the average is of monumental importance. Large or small numbers can have sizable changes on the average. 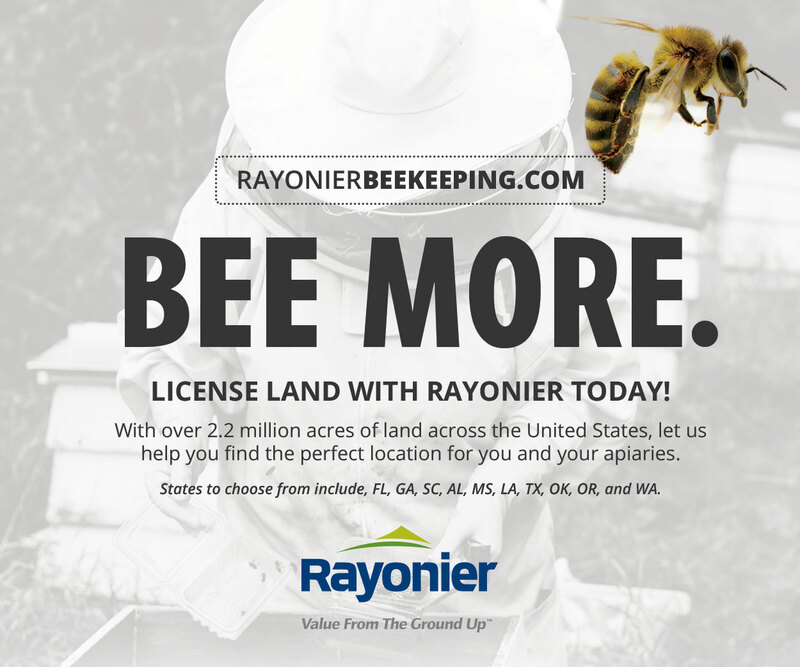 Without Hive 39, the average increases to 77.5 pounds. Figure 7. 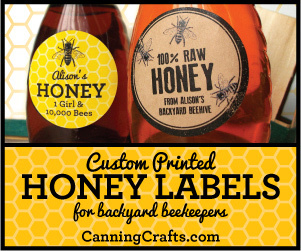 Hives for Summer 2016. 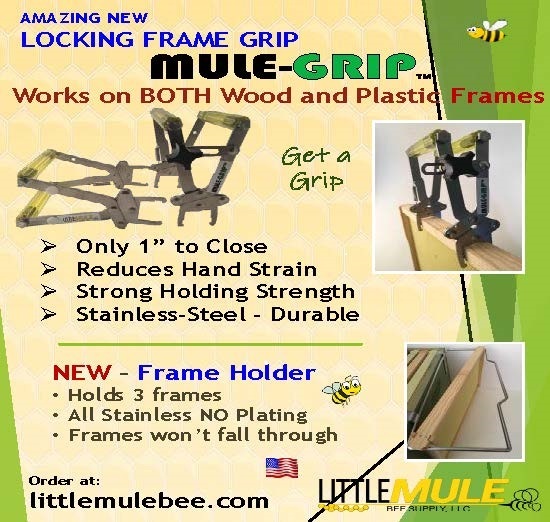 The horseshoe layout with alternating entrances is to reduce drifting and is efficient for hive mobility, loading, and unloading. Total weight gain was 336 pounds for five hives. 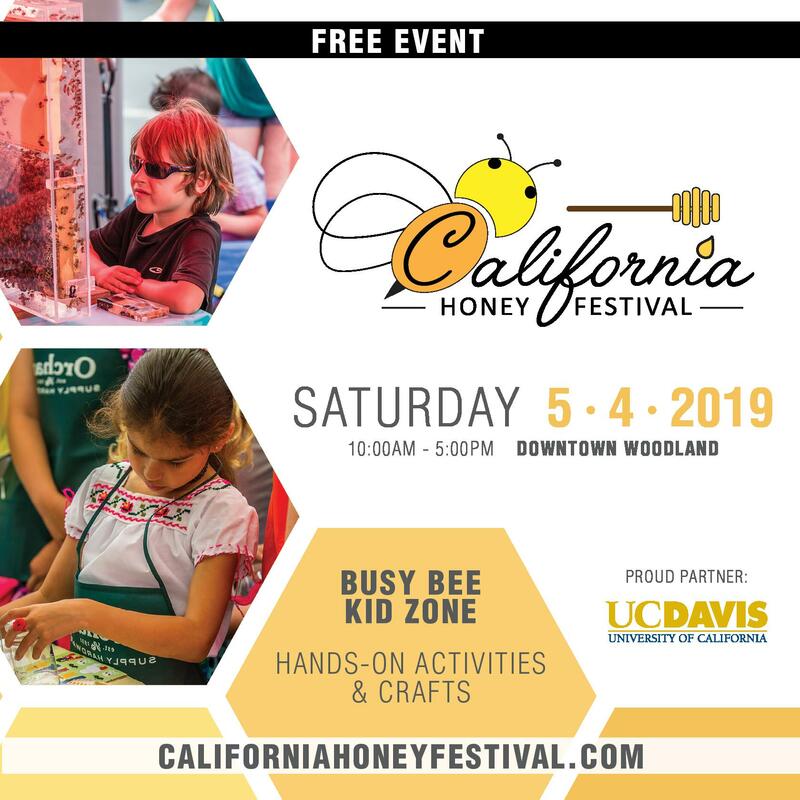 In Table 1, on the row giving the averages, the average weight gain of 67 pounds included Hive 39, regarding its initial hive weight as not rare. If a colony like Hive 39 is uncommon, it will probably not be present in another arbitrary choice of five hives for cotton honey production. 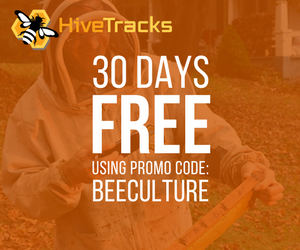 Then the average weight gain without Hive 39 may be the more appropriate one to use. That conservative average was 60.75 pounds (given below Table 1). The colonies returned healthy (see Figure 6). All of the cotton colonies survived the Winter and helped to keep last Winter’s losses to 11%. In the Spring of 2016, a long cold rainy period occurred in our main nectar flow. With the Spring nectar flow demolished, I needed Summer cotton more than I had planned. The rainy wet Spring delayed crop planting. Cotton plants were noticeably smaller in some fields close to the apiary while the overall acreage seemed about the same. The Summer had plenty of rain, and nectar production seemed normal. I transported some of my lighter colonies by hefting them in the apiaries on the morning of the move. In several trips beginning around July 20, 2016, I moved 14 three-foot hives, five two-foot hives, and tested out future logistics by moving just two five-foot hives (see Figure 7). For the three-foot hives, Table 2 has the same layout as Table 1. 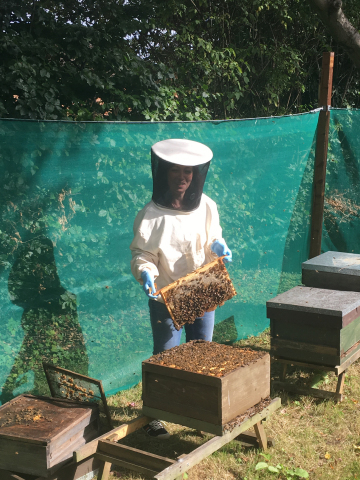 The initial hive weights were mostly low because of the Spring rains. 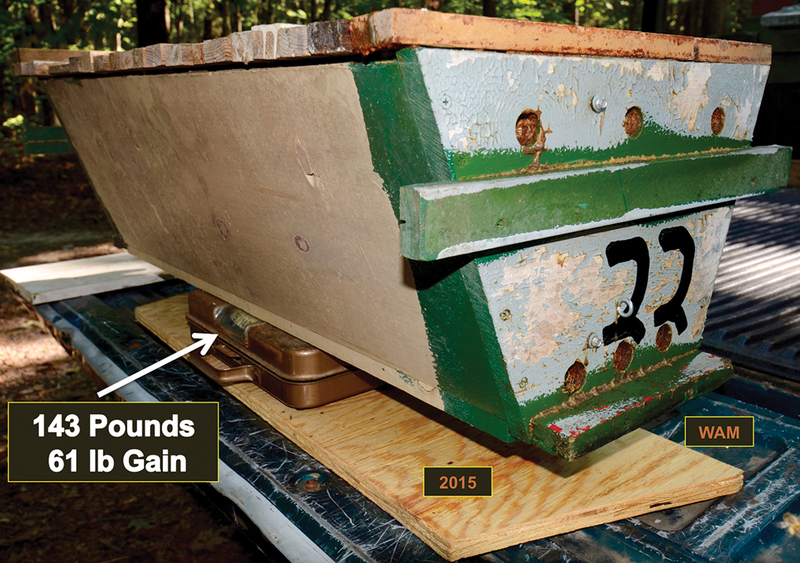 Notice Hive 6, its initial weight of 49 pounds, had a sizable gain of 84 pounds, something like Hive 39 at 93 pounds. 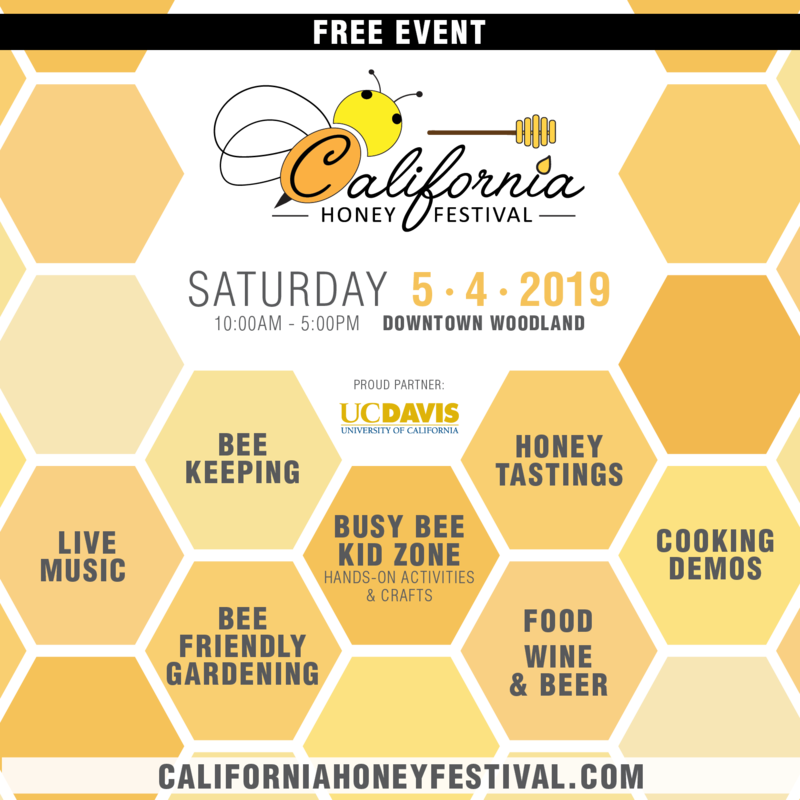 Although Hive 4, its initial weight of 46 pounds, had a gain of 53 pounds, good, but it was substantially lower than both Hives 39 and 6. 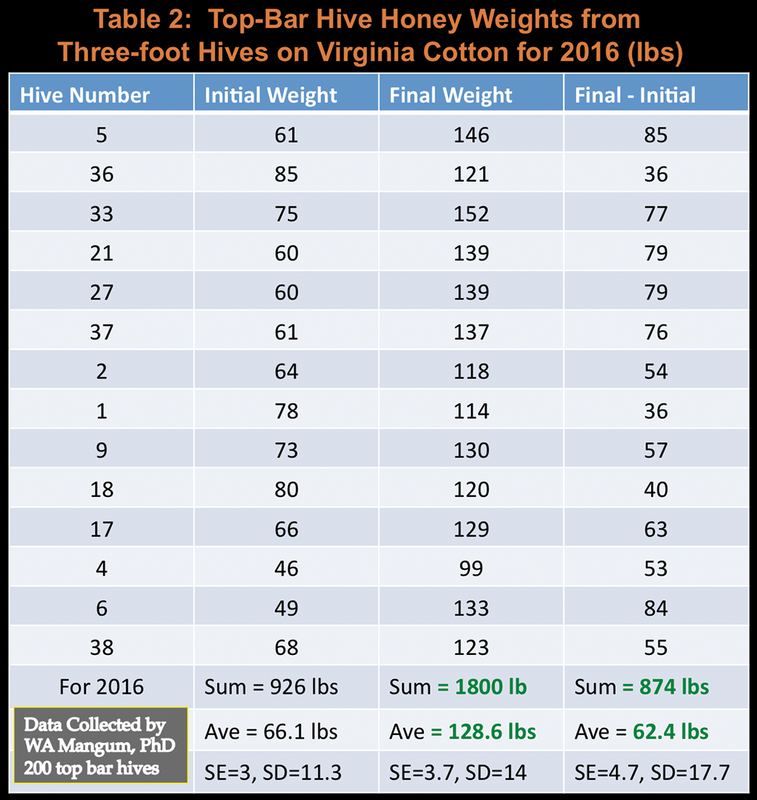 Going out to cotton, the three-foot hives weighed 926 pounds total and their average initial hive weight was 66.1 pounds, noticeably less than the initial average hive weight of 71.2 pounds in 2015 (including Hive 39 since similar light-weight hives were included in 2016). Figure 8. Five-foot long hive, loading and weighing. Loading is easy – not weighing. Even the light-weight 165-pounder is hard to weigh. I used the long two-by-four to lever up the hive on the short two-by-fours. Then I let the hive down on the scale. I am working on improvements. I marked the location of the queen excluder. It divides the brood nest with nonsurplus honey (entrance end) from the surplus honey end of the hive (back end). With full-size colonies and honey crops, these hives could easily exceed 200 pounds. 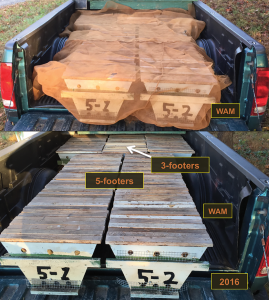 When I hauled the three-foot hives home in October, together they weighed 1800 pounds, almost a ton. 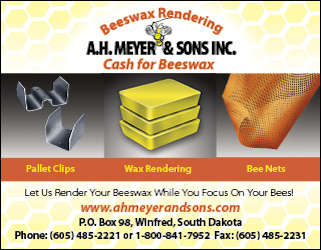 Their average hive weight was 128.6 pounds. By inspection, the 2016 average weight gain of 62.4 pounds seemed similar to the gain observed in 2015 of 60.75 pounds (using the lower average). Rounded to the nearest pound, the result is 61 versus 62 pounds for 2015 and 2016 respectively. In actual top-bar hive management, the beekeeper should conduct a multiple harvest during the flow, but I wanted to weigh the hives intact. 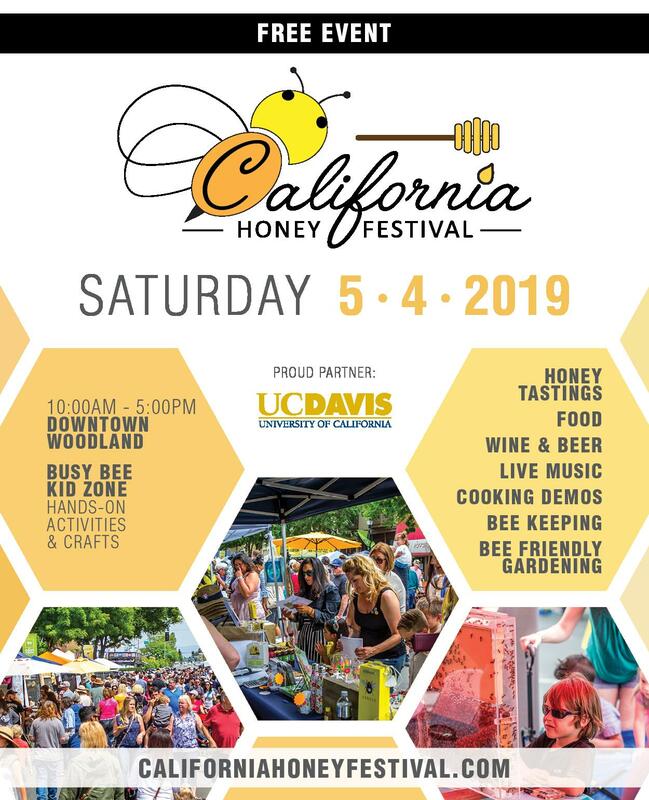 When the hive begins to become full, I expect a crowding effect to occur where the bees slow their foraging, something like a crowded colony before a Spring swarm departs. My next goal is to repeat this observational study with five-foot long top-bar hives. 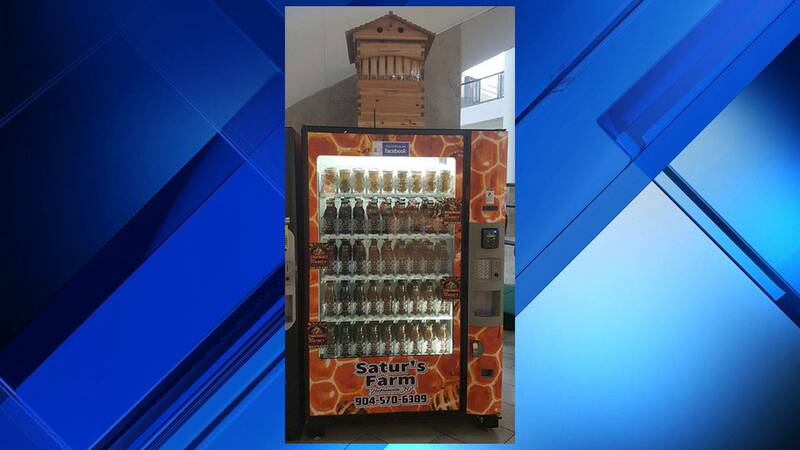 Compared to the three-foot hive, the five-foot hive adds two feet of honey storage space at the rear of the hive or room for about 14 more honeycombs. The five-foot hive should remove the foraging decrease due to a “full” hive effect. After the data collection, I loaded up the hives (see Figures 9 and 10) and hauled them to their home apiaries. My plan is to return to cotton with more five-foot hives with Hive 39 colony conditions, aiming for 100-pound gains. 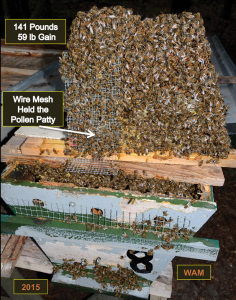 Even Hive 5, with its 85-pound gain, suggests this goal is feasible. Strict management for honey production could bring these uncommon high gains (85 and 93 pounds) to become more uniform throughout the hives. And if achieved, I would not be the first. Abrol claimed annual honey crops from well-managed top-bar hives of 110-265 pounds under Asian beekeeping conditions (Abrol, 2010). With a larger operation, more hives, perhaps we can begin to achieve honey by the ton from top-bar hives. Abrol, DP (2010). 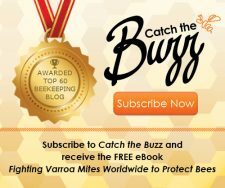 Beekeeping: a comprehensive guide to bees and beekeeping. Scientific Publications. Jodhpur, India.